After I was imported from San Antonio, Texas to Dallas in 1957, I made paintings, exhibited work, traveled, taught art and opened Atelier Chapman Kelley (ACK). In 1959 I expanded my atelier by adding an art gallery and frame shop. The expansion included having the sculptor Heri Bert Bartsch teach a class in what he knew best. Then in 1960 I won first prize at the Twenty-Second Annual Texas Painting and Sculpture Exhibition. The Texas Annual was the kingmaker of artists and was sponsored by major Texas art museums, including the Dallas Museum of Art. ACK’s future needed a business manager. My first choice was a fine sculptor, H.J. "Harvey" Bott. Harvey lived with his wife Margaret on The Strand in Galveston, TX. It is now a National Historic Landmark District, an area of mainly Victorian era buildings. Harvey graduated from Thomas Jefferson High School in San Antonio, TX, a year after I did and played in the school band with my sister Pat. The Botts went to New York City with us, the site of my first exhibit. The role of business manager didn't suit Harvey and obviously I didn’t need a gallery director. For a while Perry Nichols’ son Christopher worked as ACK's business manager. Before my 1964 New York exhibit Murray Smither asked me if he might have the job. At the time of his request he worked at Texas Instruments putting to use the journalism education background he studied at Sam Houston State Teachers College, (now known as Sam Houston State University) located in Huntsville, TX, his hometown. I suppose a prerequisite high security clearance for his job at Texas Instruments had something to do with his wanting to leave TI. Even though he had attended some of my art classes, he didn't seriously pursue making art. As business manager Smither accompanied some of his art teachers from Sam Houston State Teachers College to where the teachers juried the first prisoner art exhibit at the Texas State Penitentiary at Huntsville, TX. He returned with several prisoners' work from the show and he told me that he thought they were "cute." When I saw them I said that one small blue and red pencil drawing by Frank A Jones was far more than cute. I instructed Smither to return to the prison to ask Jones, of course with prison officials' acknowledgement, if I, as Atelier Chapman Kelley, could be the exclusive representative of all of his work. And to inform Jones that ACK would supply him with better and larger paper and color pencils of a wider color variety. Smither did as I asked. As a result, I had Smither take several of Frank's works to New York where he showed them to his friend Paul Rogers Harris. Harris for a short while had a job at the Museum of Modern Art. However, the museum didn't buy any of Frank's pieces. Even though Frank had talked of his earlier drawings, those prior to 1964, none have surfaced. We introduced Frank's work to the rest of the U.S. by submitting it to juried museum exhibits. Thus Frank began to be accepted as a fine contemporary artist. For example, Jones and Nathan Oliveira split the top prize at the Weatherspoon Gallery's (Museum) Art on Paper exhibit. Frank was invited to make a personal appearance at the University of North Carolina to receive his prize. Regrettably for all involved, we reported to Weatherspoon staff that the prison warden would not make an exception and allow Frank to venture outside. Frank was born sometime around 1900. He was biracial; his parents were Native American and African. He was a functional illiterate. Given the Southwest's historical climate, coupled with Frank's mixed blood lineage and lack of formal education, he was misperceived--by the larger predominantly white Texas society--as a misfit and therefore suspect. At the facility where Frank was held, prison officials like Tony Schindler (his supervisor) made it known that he thought Frank was innocent and had become the town scapegoat--Schindler and others thought Jones had been, pardon the cliché, "sent up the river" for others' crimes. Texas state senator John Field and his wife Beverly, the local top interior decorator (and a great beauty) were friends of mine. They took a great liking to Frank's work and Beverly even began to collect it. John started a campaign to have Frank pardoned by Governor John Connally. Unfortunately, Field died of a heart attack and with it the hope and prospect of gaining a pardon for Frank were dashed. Frank's last and final will provided for the proceeds of his estate to establish a fund for scholarships for high school art students of his hometown, Clarksville, TX. This was what he wished despite the perception that Clarksville officials were suspected of using Frank as a town scapegoat and had victimized him. Had Franks' desire reached fruition, it would have been a wonderful end for his legacy. However, it was not to happen. For example, a very promising Clarksville art student scholarship candidate surfaced. I and others submitted a recommendation to The Honorable Judge Amos A. Gates (county probate court) for the candidate to receive a scholarship. We received no reply. 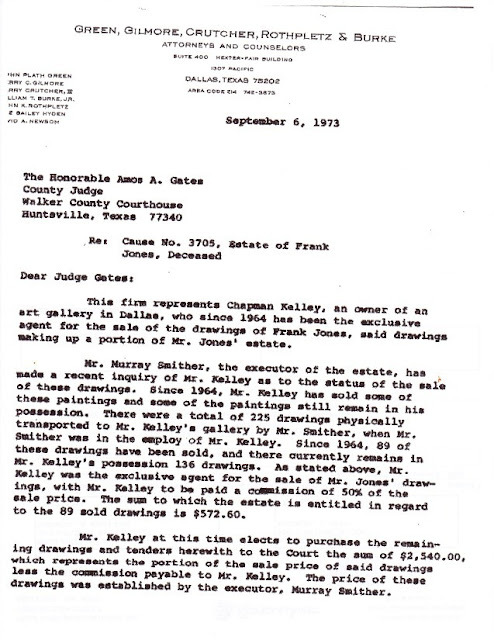 My then-attorney, David A. Newsom of the law firm Green, Gilmore, Crutcher, Rothpletz & Burke sent a check to Judge Gates for the purchase of the Frank Jones estate in the amount that Frank would have directly received for each drawing. The judge informed us that Smither had been named executor of Frank's estate and that we had to deal directly with him. Instead, Smither got back to us demanding a larger price relating to full retail value of Jones' work plus other monies amounting to what I considered to be an extortionate amount of cash. 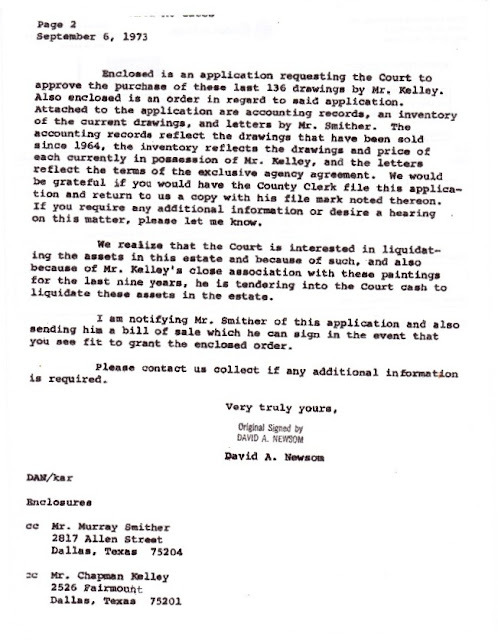 Undeterred by the high money request, in 1973 I purchased the Estate of Frank A. Jones. In prison Frank had gone for many years without a penny for a piece of candy or a stick of chewing gum. No visitors came to see him during the same period. Even though ACK sold his work for only $10 to $50 each, from those earnings Frank was able to purchase expensive Benson & Hedges cigarettes. He became the proud owner of the largest gold watch in the entire prison. His bank account grew to have over $1,000. Interviews with outside media followed, commensurate with his growing artistic fame. Huntsville prison inmates were periodically given parole hearings. By 1968 Smither was aware that Frank was to be released from prison. An arrangement had been made to release Frank with some jobs lined up for him on the outside to insure that he had a steady income. When I asked Smither what could be done to help Frank obtain a parole, he reported to me that the prison psychiatrist didn't feel that Frank could survive in the outside world. He further stated that with all the new attention showered on Frank that he was content with the only home he had known for many years--Huntsville State Prison. However, in 1968 I was listening to the Rev. Martin Luther King Jr. funeral on the radio while driving to Dallas from Houston and I stopped in Huntsville for a visit with Frank. As I prepared to leave I asked him if there was anything I could do or get for him. His reply was, "Yes, get me out of here." I was startled because this wasn't at all what Smither had conveyed to me. Smither was well aware that he was being paid to keep Frank happy with art supplies and to find a way to get him out of prison. When I returned to Dallas I reemphasized to him that he was to do everything possible to seek Frank's release. After 1970, in the wake of Smither no longer being an employee of ACK, my new employees went through all of the atelier correspondence files. Despite representing himself as such, Smither was a business manager and never a director at Atelier Chapman Kelley. 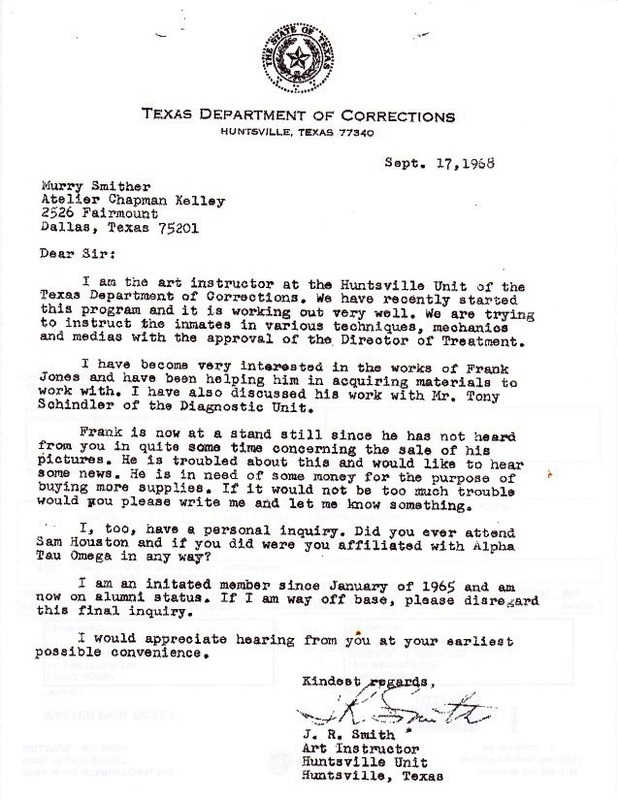 The staff found a number of complaints from the Huntsville prison staff, even from Frank Jones himself, about his neglecting to tend to Frank's artistic and well-being needs. We found a copy of a letter Smither wrote on December 27, 1966 to Huntsville prison officials. To our astonishment the letter intimates that Smither meant to keep Frank in prison, essentially betraying him. After Smither's severance from Atelier Chapman Kelley, we found a stack of Jones' work, completely and inexplicably out of place, squirreled away in the storage building behind my gallery. In addition, several times the gallery and studio had previously been unlawfully broken into; the three perpetrators were professional thieves. They were willing to go to prison rather than confess the identity of who had sent them and refused to name the targeted objects of the burglary. In the 1980s Smither took Bud Drake and his wife into the storage building to retrieve several of Bud’s sculptures. In the winter of 1969 we received a telephone call from the prison on the day before Smither was to physically meet with Frank immediately upon checking out. As Frank feared, he never made it out; he died while incarcerated. I held his work off the market for about a decade until an important travelling exhibit of Frank's work was held at the Mulvane Art Center, Topeka, Kansas, which was organized by Jim Hunt. Jones work is referenced in a book on folk art authored by art collector and curator Herbert Hemphill. Hemphill was one of the founders of the American Folk Art Museum in New York City. He and the museum have purchased Jones' work. The renaissance of American art during the 1950s and 1960s had lost its steam and some smart dealers gave folk artists the new name of "outsiders." A very important new movement was born. Because Frank fit this image (not unlike French Post-Impressionist painter Rousseau) his work soon was in demand; we accepted exhibits for him which were held in Philadelphia, Chicago and New York. Frank quickly became a star in this new category. Later I was approached by William "Bill" Steen who wanted to curate an exhibition and publication of Frank's work. It would take place in Houston, TX at The Menil Collection. The Menil Collection has Jones' work. More recently in my return to Dallas in 2006, having been in Chicago since 1983, I learned that Smither has been very busy dealing in the resale of Jones’ work, much to the sorrow of some original owners. Much to my surprise, he co-curated a Southern Methodist University exhibit of Jones' work. Since I'm the owner of the Estate of Frank A. Jones, it seems bizarre for him to be intimately involved in a solo exhibit of Frank's work without SMU ever reaching out and using me as a professional resource. There have been stories floating around since the 1960s that some of Frank's fellow inmates, as art students, quite expectantly imitated his work, "fakes," each with the hope of gaining sales and becoming famous. "New" items alleged to be Jones' work have shown up without the iron clad provenance that begins with Atelier Chapman Kelley. I am the only one in the position to authenticate his work and have always been the exclusive dealer of Franks' work. Many dark possibilities loom on the horizon waiting to be solved. Decades ago University of Texas at Austin art history student Lynne Adele approached me about her research, a master's degree thesis on Frank. In it she mentioned that her husband was incarcerated at Huntsville during the same time as Frank Jones. I allowed Adele to study all of my records pertaining to Jones and when I was furnished a copy of her thesis, I asked her why she had not included Smither's betrayal of Frank in it. She had no answer. Confusing the situation even more is that reference to Adele's work about Jones continues to be regurgitated on the Internet while omitting not only the true history but also leaving out any reference to Frank's sole estate representative, yours truly. For an art historian to continue to ignore the Smither correspondence as disgraceful factual history brings into doubt both her integrity and that of the university museum she represents. An art historian has a responsibility to tell the truth, and the whole truth so that bogus or stolen work will not confuse and ill serve future generations. Very recently we learned that it appears Murray Smither has still not paid out the proceeds, generated by the 1973 sale of Jones' remaining drawings, to the Clarksville Independent School District. It was cash that was to solely benefit Clarksville high school district art students. Much of this and more can be gleaned from the Houston Post newspaper (now defunct) art critic Susan Chadwick's lengthy articles about the matter. 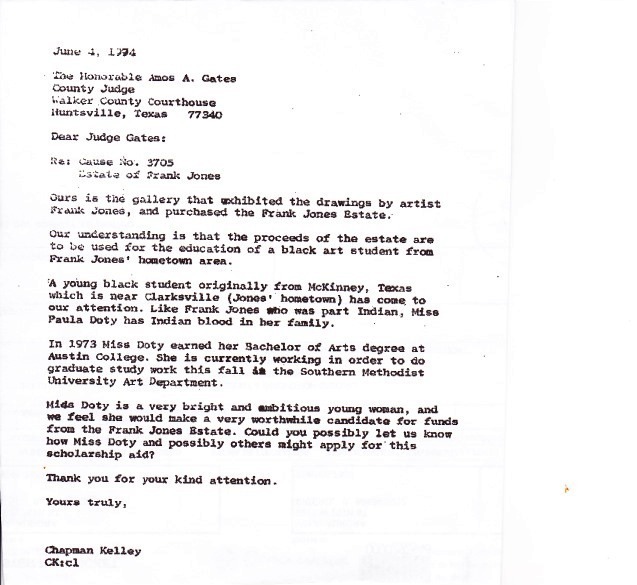 In her April 23, 1990 article titled 20 years later, Jones’ scholarship find still not established, she wrote, “But the drawings were to be sold, according to his (Jones) will. And the proceeds were to be used (by Smither) to establish a Frank Albert Jones scholarship fund.” …And the $5,000.00 received in 1973 for the drawings in the estate is not accounted for.” Former Dallas resident James Surls, was quoted. “Frank Jones had an enormous impact on me,” said renowned Texas sculptor James Surls,” Chadwick wrote. She penned another article about Jones just two months later in June of 1990. Chadwick was contacted earlier this year at her home in France and she was thrilled to learn that the unfinished business of the funding issue was being discussed anew. She mentioned that she still has the notes used to write the newspaper articles. Actually, Ms. Pam Bryant, Superintendent of the Clarksville Independent School District was also recently contacted and remarked that as far as she knew, for an "indeterminate" number of years a check for $200.00 had been received. Susan Chadwick in her article wrote that the checks have been “financed by an anonymous donor.” I get the strong impression that the lion's share of the proceeds has not been forwarded to school Superintendant Pam Bryant by Smither. Had the $5,000.00 been deposited into a bank account by the Clarksville school district beginning in 1973, the time the estate was liquidated, the interest and principal would have by now easily grown to over $100,000.00! And that's using a very conservative commercial loan interest rate pegged to the annually adjusted Federal Reserve prime interest rate. So does Smither owe the Clarksville Independent School District somewhere well over $100 grand? I am no legal scholar, but it seems to me that a Frank A. Jones fully executed last and final will is black letter law, is not subject to a statute of limitations and is binding and enforceable even to this very day. Wouldn't it have been a much happier legacy for Frank to have been released in 1967 and to have lived to a ripe old age visiting with serious art students? I had envisioned that scenario while teaching at Northwood. His is an example of a great artist making marvelous works despite being illiterate and having had a late start creating work at age 64. And then crowning the legacy by leaving a much larger estate of his work selling at today's value and becoming available to high school art students via scholarships tied to Frank's hometown--Clarksville! I would argue that Frank Albert Jones’ artist, moral and legal rights have been violated in this morbid case. But for a lack of others' professionalism, honesty and human decency, Frank's life's end should have been as happy as his "haints" as he called them, once captured and tamed in his wonderful works. As a well trained, successful, experienced professional, as a painter, art dealer, art teacher and art collector, including being the dealer and collector of Frank's work, I am most familiar with his work; I have quite a different history and work interpretation of the real significance within his work. I would not question the historic facts of his life but it has always seemed to me that the restraining of the vast majority of his "haints" indicate that he had overcome or exorcised them and they were as he, helplessly confined and thus comfortable to live with. Note: With the exception of the newspaper images,all of the above is copyrighted material, all rights reserved. Permission for use will be considered upon written request. Blog comments are encouraged, the use of actual full names is strongly recommended, as are affiliations with organizations.